Frances Aparicio, Professor Emerita of Spanish and Portuguese at Northwestern University, will join UVA AMST professors Camilla Fojas and Carmen Lamas in a roundtable discussion on the Past, Present, and Futures of Latinx Studies tomorrow, Thursday, Feburary 28th, in Wilson 142, from 4-6 PM. Refreshments will be served. The American Studies Program presents a talk by Gabriel Rosenberg, Assistant Professor of Gender, Sexuality and Feminist Studies at Duke University: No Scrubs: Livestock Breeding, State Power, and Eugenic Knowledge in the Early 20th Century United States. The talk will be held Wednesday, March 20th, from 12:00-1:30 PM in 117 Wilson Hall. Lunch will be provided; please RSVP to AMST administrative coordinator Aida Barnes-May (amb7hh) before March 15. The event is co-sponsored by the Woodrow Wilson Department of Politics, the Power, Violence, and Inequality Collective, and the Food Collaborative. Prof. Carmen Lamas's essay, "Father Félix Varela and the Emergence of an Organized Latina/o Minority in Early Nineteenth-Century New York City" appears in the Cambridge History of Latina/o American Literature, which was named a 2018 Choice Outstanding Academic Title by the American Library Association. Prof. Sandhya Shukla has won the 2018 American Studies Association Critical Ethnic Studies award for her essay, "The Visual and Textual Lives of Harlem Solidarity: Yuri Kochiyama's Relation to Malcolm X." The committee chair writes: "The prize committee was especially impressed by [Prof. Shukla's] nuanced consideration of Kochiyama in relation to 'revolutionary Blackness' and Harlem's historic cosmopolitanism." Prof. Jessica Sewell published an entry entitled "Public Space in the American City" in the Oxford Research Encyclopedia of American History. Prof. David Singerman's article, "Science, Commodities, and Corruption in the Gilded Age," won the inaugural 1500 Penn Prize of the Treasury Historical Association. He will be presenting a talk at the U.S. Department of the Treasury next month. UVAToday has more on Prof. Singerman's achievement here. American Studies majors Kyle Guy, De'Andre Hunter, and Ty Jerome were among the students interviewed for a recent issue of UVAToday, featuring a Q&A with UVA men's basketball players. Kyle called Prof. Carmenita Higginbotham's Disney course his favorite class and discussed how he chose to major in American Studies, and De'Andre and Ty spoke to other aspects of the student athlete experience. Photo credit to Matt Riley, UVA Athletics. Carmen Lamas Featured in "The Class That Rocked My World"
Prof. Carmen Lamas's class Race and Ethnicity in Latinx Literature was featured in the UVAToday Illimitable story "The Class That Rocked My World." 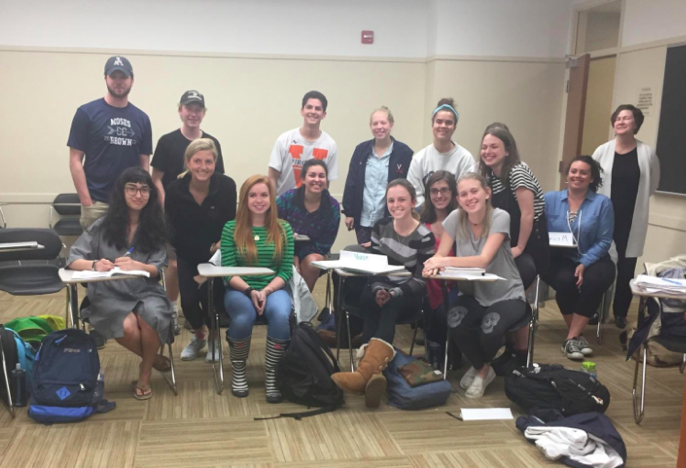 Fourth-year student Alex Cintron describes the experience of learning about "people like me" as meaningful, and highly recommends Prof. Lamas as a teacher of Latinx literature and culture. Congratulations to Prof. Lamas. Students interested in taking a class with her should note that the American Studies Program is offering Hemispheric Latinx Literature and Culture in the spring semester. American Studies Postdoctoral Fellow Gill Frank has had an article published on the blog Jezebel. In it, he discusses the history of illegal abortions in the United States. Congratulations to Prof. Frank! Check out this interview with NPR member station WHYY's program, Radio Times, featuring our new postdoc in American Studies, Gill Frank. He appears at the 32 minute mark. He also has an article coming out in Jezebel on Sept. 4. Prof. Frank is teaching a new 4000-level course this fall called "Politics of Reproduction" and will be teaching two courses for us in the spring. Read his bio and contact info here: http://americanstudies.as.virginia.edu/people/gaf4xf. Congratulations to Professor Jack Hamilton, who has received an Honorable Mention for the 2017 Woody Guthrie Award for outstanding music book of the year by the International Association for the Study of Popular Music. Professor Hamilton's book, Just around Midnight: Rock and Roll and the Racial Imagination, was published by Harvard University Press in 2016. Professor Hamilton has also won a Seed Grant from the Whiting Foundation's Public Engagement Fellowship program. What is American Studies? What can you do with your American Studies degree? Come join us upstairs at Grit on Tuesday, March 27 at 7 pm to find out. Explore fall course offerings, learn about career opportunities, and hear from professors, alumni, and current majors. Refreshments will be provided. All are welcome to attend! Check out the Facebook event here. Celebrate the New Latinx Minor at UVA! Monday Oct 30th at 6 pm in Wilson 142, Professor Lázaro Lima will present a lecture, "Latino Studies 2.0: Black Lives, Brown Bodies, and the Ends of the Democratic Commons in the Neoliberal University.” Reception to follow in Wilson 117. Prof. Lima is a professor of Latino Studies and American Studies, and Associate Provost for Faculty at the University of Richmond, where he holds the E. Claiborne Robins Distinguished Chair in the Liberal Arts. His work centers on the political emergence of Latino/a forms of civic personhood, and the attendant institutional, juridical, and cultural industries that enable Latino/a democratic legibility and participation to emerge in civil society. This event is sponsored by the Americas Center/Centro de las Américas and the Institute for Humanities and Global Cultures at UVA. Please join the faculty and students of UVA American Studies this Thursday, October 5 at 6:30pm in Wilson 142 for another meeting of Pizza & Praxis, our regular series of informal gatherings of American Studies majors to discuss American Studies topics far and wide. Thursday’s meeting will be dedicated to the ongoing protests against police brutality and racial injustice that been taking place in the NFL and other professional sports leagues, and discussing the broader role of sports and athletics with regards to political activism, both historically and in the present day. The first time he "took a knee” during the National Anthem back in 2016, Colin Kaepernick joined an illustrious tradition of athletes who’ve used their platform to speak out or demonstrate against injustice (a tradition that includes Muhammad Ali, Tommie Smith and John Carlos, LeBron James, and many others), and also became subject to attacks from critics and declarations that he should “stick to sports.” We can discuss these and many other issues on Thursday. As always, this will be an informal and friendly gathering, with plenty of free pizza (of course) to go around— you need only bring your thoughts and your appetites. We hope to see you on Thursday! Nancy MacLean, the William H. Chafe Professor of History and Public Policy at Duke University, will present a talk entitled "The Virginia Roots of Today's Radical Right & the Crisis of American Democracy" on Thursday, October 12th at 7pm in Clark 108. All American Studies majors are encouraged to attend! Please join the faculty and students of UVA American Studies this Tuesday, September 5 at 6:30pm in Wilson 117 for this year’s first meeting of Pizza & Praxis, our regular series of informal gatherings of American Studies majors to discuss American Studies topics far and wide. Tuesday’s meeting will offer students and faculty a chance to reflect together on the events of August 11th and 12th. Among many other potential topics, we can discuss what happened, and how and why; how the university and the city government responded; and what larger cultural and historical contexts can help us to better understand and confront these violent and hate-filled events going forward. This will be an informal and friendly gathering, with plenty of free pizza (of course) to go around—you need only bring your thoughts and your appetites. We hope to see you on Tuesday! Welcome back. The arrival of armed white supremacists at the university and in Charlottesville on August 11th and 12th, and of the KKK earlier in the summer, is shaping all of our experiences of return. As director of American Studies I want to say that all of our doors are open to you to process the difficulties of this moment. In American Studies, we’ve also decided to skip the usual welcome back picnic this year and move straight to a Pizza and Praxis gathering that will allow us to come together as a community and discuss what happened, how the university and the city government responded, and what larger cultural and historical contexts can help us to better understand and confront these violent and hate-filled events. Our event will be on Tuesday, September 5 at 6:30 pm in the Wilson Hall lobby on the first floor. We met as a faculty yesterday to plan this gathering. We believe that the courses we teach in American Studies are all implicitly if not explicitly devoted to analyzing the long history of white supremacy, from its roots in settler colonialism and slavery through its current manifestation in the U.S. and here at UVA and in Charlottesville. We have been teaching that white supremacy is not simply the spectacular outburst of hatred and violence that you witnessed on August 11th and 12th. It is also a larger structure of thought that has been normalized over centuries in ways that are often invisible to those who benefit from white privilege. We also believe that it is too soon to pronounce ourselves at UVA as a community in healing. The spectacular symptom may indeed recede, even as it makes its way to other parts of our national body and indeed the world, but the disease is still present and must be monitored with all the care and intelligence that we can muster. We hope that our classes and our events in American Studies can be part of this effort to know and understand the relation of white supremacy to our various pasts—institutional, local, national, hemispheric, and global—and to our ongoing present. And we hope that our studies of the multiple, vibrant, and long-lived traditions of anti-racist cultural, political, and aesthetic practices in the U.S. and the wider Americas can be a resource—not for "moving on," but for better knowing where we actually are. To that end, we plan to dedicate our Pizza and Praxis and other events this year to a very basic theme: White Supremacy and Anti-Racism. Stay tuned for announcements of these events and please circulate widely and check our website and FB page for postings. Professor Camilla Fojas has been named Co-Director of the Global South Lab, which is affiliated with the Institute of the Humanities and Global Cultures (IHGC) at UVA. Prof. Fojas has a joint Mellon Foundation appointment with the American Studies Program and the Department of Media Studies. Her research explores transnational Asian, Pacific, and Latinx American cultural and media studies in a comparative imperial context. She is the author of five books: Cosmopolitanism in the Americas (Purdue UP, 2005), Border Bandits: Hollywood on the Southern Frontier (University of Texas Press, 2008), Islands of Empire: Pop Culture and U.S. Power (University of Texas Press, 2014), Zombies, Migrants, and Queers: Race and Crisis Capitalism in Pop Culture (University of Illinois Press, 2017), and Migrant Labor and Border Securities in Pop Culture (Routledge, 2017). She is currently working on a new project on surveillance and borders tentatively titled Border Securities. Three American Studies majors were inducted into Phi Beta Kappa on April 30. Congratulations to Erin Falk, Olive Lee, and Emily Lesmes. What a huge honor! Only about 10% of the nation's colleges and universities have Phi Beta Kappa chapters, and only about 10% of the Arts & Sciences graduates of those institutions are considered for membership, making the society one of the most selective in the nation. PBK is a lifetime membership. David Singerman talk on "Sugar, Knowledge, and The History of Capitalism"
David Singerman, Visiting Scholar of American Studies and the Americas Center/Centro de las Américas, will deliver a public lecture on Friday, May 5 at 2:00p.m. The talk, "'En la producción auzcarera todo está metrificado': Sugar, Knowledge, and The History of Capitalism," will be held at the Center for Global Inquiry and Innovation, Hotel A. Reception to follow. 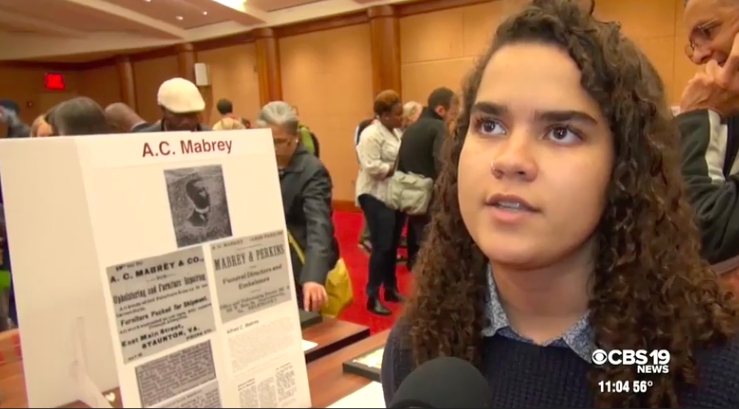 The students in Professor Lisa Goff's Hands-On Public History course organized an exhibit commemorating the lives of those buried in Charlottesville's Daughters of Zion Cemetery. 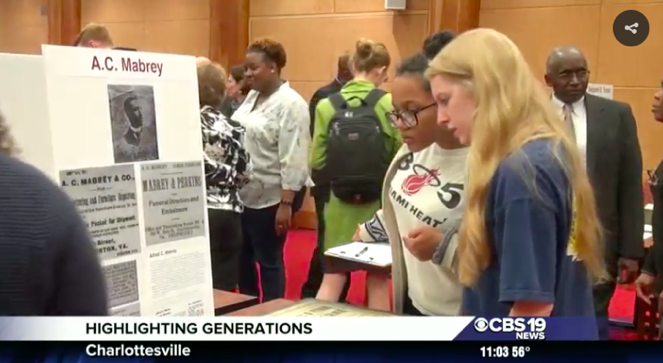 The event, "Gone But Not Forgotten: Exploring Charlottesville's African-American History at Daughters of Zion Cemetery," was held on April 19 at the Special Collections Library's Harrison-Small Auditorium. The exhibit was curated by the students in Hands-On Public History, in conjunction with the Preservers of the Daughters of Zion Cemetery. Local network CBS 19 News covered the event; you can read the story and watch the video here: www.newsplex.com/content/news/Remembering-the-people-buried-in-Daughters-of-Zion-Cemetery-419973753.html. Dan-el Padilla Peralta, author of Undocumented: A Dominican Boy's Odyssey from a Homeless Shelter to the Ivy League, will discuss his work on April 9, from 6-8pm at 1 West Range, Hotel A. On Saturday, March 25, American Studies Professors Camilla Fojas and Jack Hamilton, along with Glenn Frankel, will speak at the Virginia Festival of the Book panel "Pop Life: Cultural Influences of Media." They will discuss different elements of pop culture and how they help define social and political beliefs; Siva Vaidhyanthan will moderate. 12:00-1:30pm at the UVA Bookstore (400 Emmet Street S, Charlottesville). Jack Hamilton spoke to C-Ville Weekly about his recent book, Just Around Midnight: Rock and Roll and the Racial Imagination. Read the full article here. Hamilton will discuss his work at the Virginia Festival of the Book event "Reading Under the Influence" on Friday, March 24, at 9:30pm at the Ante Room; following the talk, Robin Tomlin of Grits and Gravy will play a live deejay set. This Thursday, March 23, American Studies Professor Lisa Goff will take part in a panel discussion on race and class in America at the Virginia Festival of the Book. The panel will offer perspectives from fiction, policy and politics, and history, and encourage thoughtful dialogue on these topics within our community. 4:00-5:30pm, UVA Harrison Institute / Small Special Collections (UVA Central Grounds, 160 McCormick Rd, Charlottesville). In this article, I juxtapose the GI Bill of 1944 alongside the American Indian Relocation program. I critique Relocation as a policy more generally and argue that it must be examined as an Indian specific housing policy, an aspect of Relocation that is almost always ignored in lieu of a more-broad focus on urbanization that includes employment, discrimination, poverty, and return migrations. Further, I demonstrate how the GI Bill was a continuation of federal housing policies begun earlier in the century that worked to promote white homeownership, increasingly in suburbs, and often at the expense of people of color, including American Indian people. I examine how the GI Bill of 1944, as a proactive and effective housing policy that created new homeownership opportunities for many (white) veterans, spurring on suburban home construction, remained largely out of reach for American Indian veterans. In doing so I articulate the power of the federal government to create polices that essentially determine who should live where. The explosion in new, suburban homes after WWII brings to the surface the inconsistencies in US housing policies for these two seemingly incongruent groups – American Indians and veterans – at virtually the same political moment. Nearly all veterans of WWII were entitled to the programs and services of the GI Bill, including its home loan benefit. However, access to the home loan portion of the GI Bill, including a federally guaranteed loan, a low interest rate, and a small down payment, was severely curtailed for American Indians. Instead, many Native veterans, faced with few options and a limited job market, had to decide between life on the reservation or to participate in the Bureau of Indian Affairs Relocation Program at the war’s end. Unlike the GI Bill’s guarantee of a federally insured home loans to construct new suburban homes for white veterans, American Indians who participated in the Relocation Program were relocated to urban areas and housed in temporary venues that often-included shelters and run-down apartments with virtually no access to home ownership.